Help CentreUsing SuperControl Managing enquiriesHow do I add my enquiry sources? Enquiry sources show where guests have heard about you, for example, word of mouth or any booking channels you might be advertising with. Enquiry sources are set by you and display during the booking and enquiry process. It is a great tool to make use of in SuperControl to keep track of where your bookings and enquiries come from. 1. Go to Bookings > Booking sources. 2. Under "Show in website booking form", select "Yes" if you want the options to show on the booking/enquiry form. If you don't want a list of sources to show on your website forms, select "No". 3. Choose "Yes" for Booking sources to be a compulsory field. If you make your sources a compulsory field on your website, guests will have to say how they found you on the enquiry form before they can book. 4. Use the "Add new" button to add new sources. The key to using sources successfully is to not have any totally generic sources. For example, a source like “Google search” is not always useful. 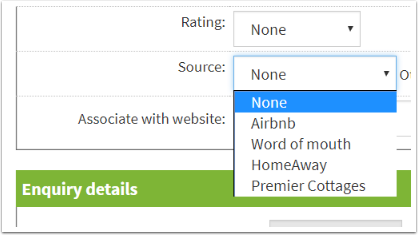 We wouldn’t suggest removing “Google search” from your list of Booking sources, but make sure you list all your possible sources (be as specific as possible) so that guests hopefully select the correct one. Many guests will begin their search on Google, which is why they often select it as the source. How do I allocate an enquiry source when making an admin enquiry? 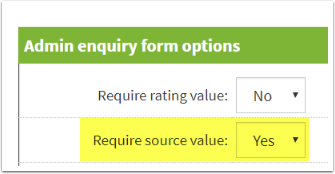 To make this field compulsory so it cannot be avoided when adding an admin enquiry go to Admin > General details, select the option below to Yes and Save. Prev: How do I convert my enquiry into a booking? Next: How do I add/edit an email template?